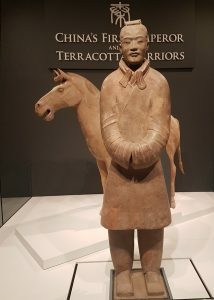 From ‘China’s First Emperor and the Terracotta Warriors’ exhibition held in Liverpool in 2018. We’ve had an interesting couple of days exploring the juxtaposition of the ancient and modern worlds on a short holiday in Liverpool. The city is currently home to the ‘China’s First Emperor and the Terracotta Warriors’ exhibition and close by is Sir Antony Gormley’s ‘The Iron Men’ art installation – and we’ve even managed to shoe-horn in some remote sensing links! 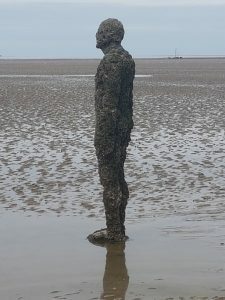 Another Place is the official name of Gormley’s installation on Crosby Beach in Sefton. It features 100 identical life-size cast iron figures – hence the local name – each weighing 650 kg and made from a cast of the artist’s own body. The statues all look out to the horizon, scattered across a two-mile section of the beach, buried to varying heights. A second interesting feature of this beach is that it has quicksand, and the unwary can be up to their knees in mud with one wrong step. Sam had one foot start to sink before we got back to firmer ground – although judging from the squeals and laughter not all groups on the beach were as lucky! This moving sand has certainly impacted the statues with some listing, while others seem to have sunk further or toppled over. Having been in place since 2005, it is interesting to note how the 100 identical statues have been differently affected by the weather and the seas – so much so that in reality the beach has 100 unique iron men. 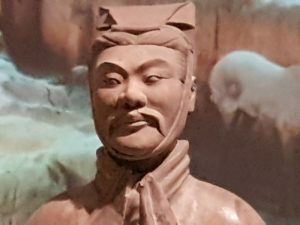 The flip side of our statue experiences moves back in time to 221 BC when Qin Shi Huang proclaimed himself First Emperor of China after conquering neighbouring kingdoms to unify China. He died eleven years later and buried in a huge site, 35 km east of Xi’an in the Shaanxi Province of China, which contains not only his mausoleum but also palaces, stables and defensive walls. Like many Chinese Emperors he was buried with an army to protect him in the afterlife, but what makes Qin Shi Huang different is that his army wasn’t the tradition scale models, his is life-size. The burial site was only discovered in 1974 by some local farmers, and to date over 2,000 terracotta warriors and horses have been discovered, alongside animals, weaponry and chariots. Most are broken and have been painstakingly put back together to produce truly stunning statues. Originally, ornately painted, but over time this has obviously faded, and some of the wooden weaponry and chariots have also rotted. In contrast to Gormley, the warriors are not identical. The torso and limbs of each statue vary depending on their role: warrior, archer, cavalry, etc. The heads are different. The hair, noses and moustaches were made by different artists, giving the impression of each warrior being unique. Although, in reality, there are duplicate features within the army. It is still impressive to see the different faces side-by-side on the statues. The extent of the overall site isn’t fully known, but there are currently plans to map it use ground-penetrating radar and combine the results with satellite images and GIS data to produce 3D and 4D models! It’s estimated that there may be as many as an additional 6,000 warriors buried in that area. It was incredible to see the crisp features of each of the warriors close up, and amazing to think that we were looking at statues made over two thousand years ago. The warriors were stunning and we’d highly recommend visiting the exhibition – it is in Liverpool until October. In two days we’ve been up close to ancient and modern statues – and both were fantastic! 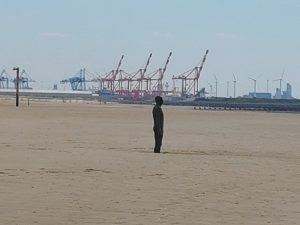 This entry was posted in Education, Satellite and tagged Another Place, china, Crosby Beach, First Emperor, Liverpool, Qin Shi Huang, remote sensing, satellite, Shaanxi Province, Sir Antony Gormley, statues, Terracotta Army, Terracotta Warriors, The Iron Men by Andy. Bookmark the permalink.